Baseball-Excellence presents: Game Day Coach explores defensive and offensive strategy, game philosophy, the power of a routine, pre-game infield, game objects... and just about everything. It is a must have for coaches! A companion to The Coaches Practice Planner and A Skill and a Drill, Game Day Coach gives the coach a guidebook to use the skills and drills from the Planner in a game. Game Day Coach explores defensive and offensive strategy, game philosophy, the power of a routine, pre-game infield, game objectives, a pitching philosophy, tips to stay out of that big inning, defensive strategy with runners on base (cutoffs and relays), bunt situations, constructing a lineup, giving signs, situational hitting, base running tips, and coaching from the boxes. Special sections on how to train yourself to see the entire field, six things to look for when your opponent takes pre-game batting practice and outfield-infield, player dugout responsibilities and Twenty questions you should never ask an umpire. 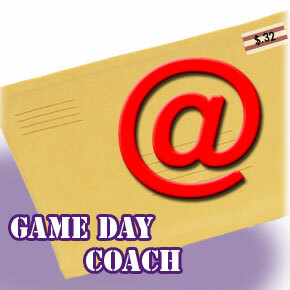 Game Day Coach will make you a better coach. Sixty-one pages. Sent via email as an attachment. (Large file. Allow 15 minutes to download at 28.8 BPS. Some free email services, such as Hotmail will not accept files of this size. )Emailed within 24 hours. Your Acrobat reader should be 4.0 or higher.